In 2010, Drs. Rob and Lisa Conroy graduated from Life University in Atlanta, Georgia. They moved to Kamloops knowing they wanted to enjoy our beautiful community. 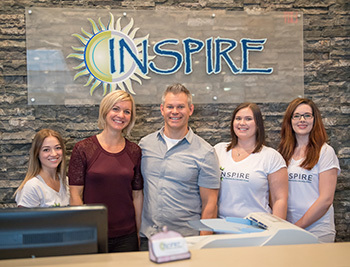 Inspire Chiropractic & Wellness Studio was opened in February 2011. We seek to inspire you to take action with your health and emphasize the importance of care for expecting moms and children. Many of our patients travel from hours away to have their babies or entire family taken care of at our health care facility, and we’re honoured to serve and support you. So many of the concerns and conditions that seem to be commonplace these days aren’t actually normal. True health means a state of complete function, inside and out. If you’re not functioning at 100%, there must be a reason. We strive to find out why that is, and how best to move you toward health. Most of the conventional approaches to health care involve masking your symptoms or giving temporary relief. We focus on correcting the underlying issues so that your nervous system can regulate, coordinate and heal at its full capacity. Our gentle, precise, science-based approach is appropriate for all ages, from newborns to grandparents. If you’d like to find out more or schedule your time with Dr. Rob or Dr. Lisa, reach out to us!